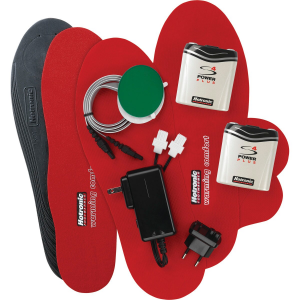 Hotronic's Footwarmer S4 Universal electronic boot warmers give a boost of warmth to ski boots, snow boots, and any shoe, really. You can cut the Heat Ready insole to fit any footwear in your closet, and the Heating Elements stick to the toes or heels for warmth where you want it most. The battery packs provide nearly a day's worth of warmth, and the recharger readies the batteries for the next day. Self-adhesive covers and strips make the setup easy and quick so you can maintain toasty toes all winter long.